Is it getting harder to wake up? 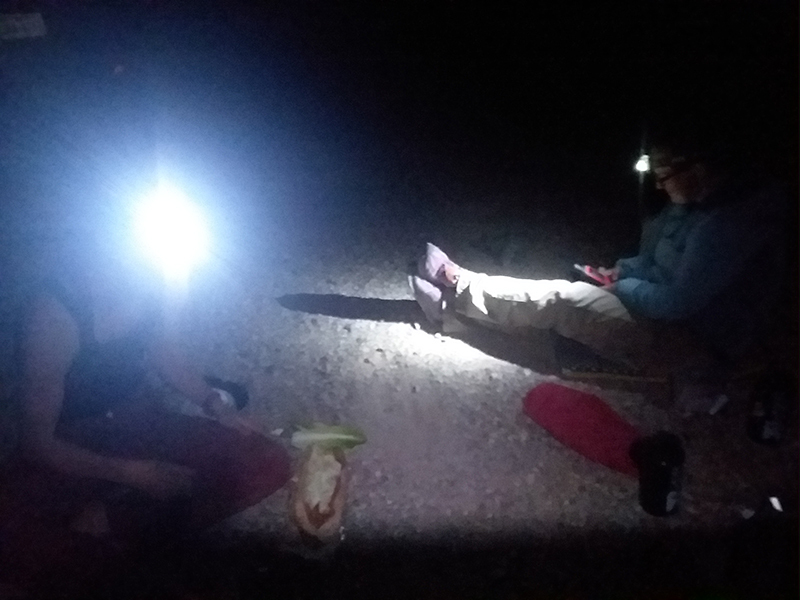 It must be the late night hiking, that or our minds are on overdrive about the upcoming logistics. To combat the sleepiness we have our tactics. The alarms go off, then go off again until we remember to work our bodies toward an upright position that vaguely resembles sitting up. We shove our backpacks and other gear under our backs to hold this position though it often results in falling asleep on top of the pile. Eventually our eyes open past a squint. Then it’s time to make coffee, so we can begin to resemble human beings. Please don’t talk to us during this process. Today the clouds that hung over the mountains all morning were a welcome presence. Thick humidity pressed down on us. 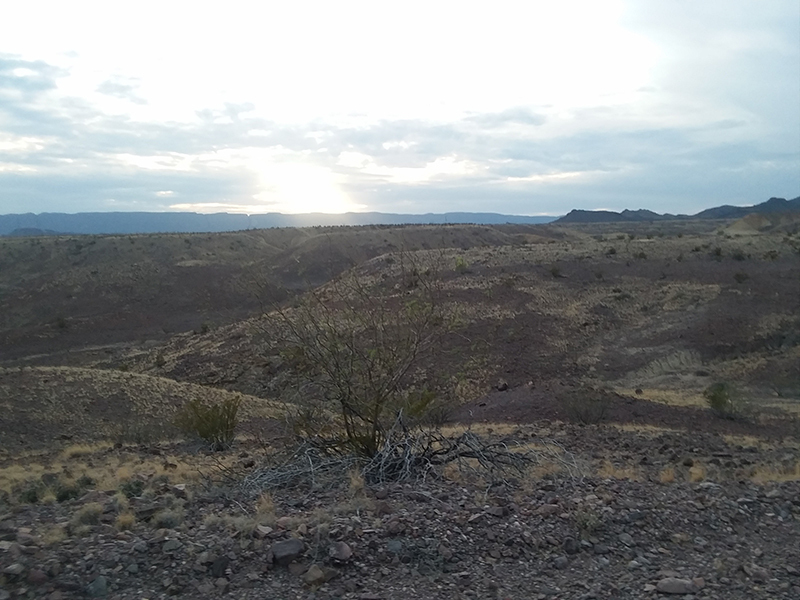 We could see the famous Chisos Mountains to the north but continued eastward along the flat river lands. We reached a junction in the road and used it as an excuse to break. Shade was nowhere to be found so we again rigged up a cover using the tent. It was an oven with the sun beating down on the dark materials, radiating heat straight onto our hot bodies. We laid out underneath, doing our best to fall asleep in the stilted and sticky air. After some largely unsuccessful napping, morale was low. Time to look at the maps and indulge in some fantasizing! Originally we had planned on rerouting to the north to get closer to our friend Nikki who would hike in from the road. But after learning that she had rented a 4-wheel vehicle we were able to expand our options. How to untangle our previous logistics? The best option - continuing to the east and meeting Nikki in her car - meant fewer miles, a route closer to the border, and access to a vehicle (and water). Everything we want. Once we started letting ourselves think about the possibility we were like kids with candy, obsessive and single-minded. Changing plans now would be extremely last minute and would definitely inconvenience tomorrow’s shuttle with Fred and Kim. But we were tired. And hot. And thirsty. Please work! We texted everyone involved on the GPS (itself a 30 minute ordeal) and received affirmative responses. Sorry to everyone for the trouble but thank you thank you thank you for making it happen. We had a new plan! Around 4:30 we pulled it together and started walking down our new route toward Nikki and her car. Our senses were attuned to any signs of a vehicle in the distance, convinced that Nikki was just around a corner. Is that her? Is that her? In contrast to the earlier despair of the day we felt like jumping around with excitement, eager to see our friend and change up our energy. It was Christmas morning. More sounds in the distance. As a vehicle approached Claire cautioned, “I’m not thinking anything. I’m not thinking anything.” We could see a single female driver in the dark grey car but the sun’s angle obscured her profile. But then - NIKKI!! We dropped our packs and jumped on top of her, dancing and shouting out greetings to our rescuer. Tenny cried (partly out of relief, mostly because she’s always a sentimental mess). Nikki is the best! She had prepared for everything we could have wanted, a ride, water, snacks and fresh vegetables. We were being taken care of and it was absolutely the best feeling in the world. We stood around the car, laughing and getting caught up while crunching our way through the most delicious cold cucumber. Our backcountry permit had us camping at Glen Springs Campground eight miles to the north. Eight miles - no problem with a car! We hopped in the vehicle as darkness set in around us. What a luxury to have such freedom of movement. Not to mention music. And air conditioning. And electrical outlets. Can you tell that we were happy?